The Fall Classic Preliminaries have been a more heated series of battles than previous years, but they aren’t quite over yet as Akira Hayama and Soma Yukihira have yet to present their dishes. But who will triumph over the other in this battle of epic culinary proportions? Food Wars! volume 8 continues where the previous volume left off, right before the Soma and Akira Hayama face-off in the Fall Classic preliminaries. This particular battle was highly anicipated, for obvious reasons, and author/illustrator duo Tsukuda and Saeki do not disappoint. Of course, both dishes are incredibly crafted and presented in the manga, but the real interesting part is the judges’ reactions as there is a heated argument over who the ultimate winner between the two is with a verdict that manages to leave both sides partially satisfied and disappointed at the same time. The difference between the number of judges that like a dish from the actual final score received was a clever way to handle the battle and keep readers guessing up until the final moment. Before the finals begin, the volume has a small middle section where the contestants celebrate their victories and prepare for what’s to come. While there are some comedic moments and Soma and Megumi’s time teaching kids how to make dumplings develops Megumi’s feelings for Soma, this portion was definitely the weakest part of the volume as it wasn’t very fleshed out and mostly just detracted from the really excellent start of the Fall Classic finals. There was a far better side story at the end of the volume that had the Nakiri cousins attempting to interact with the riffraff at the pool that showed more of Erina’s softer, slightly less tsundere side and offered more time for Alice to troll people (something that never gets old). The real highlight of the book, however, was the beginning of the finals, both for the interesting dishes and presentations (as per usual) between Alice and Soma as well as the dynamic storytelling utilized. It’s amazing how a series about making food manages to be so tense at times. Although the gap between the start of the finals and the announcement of Alice as Soma’s opponent is a mere three pages, the narrative manages to build a good amount of tension with the small space it has, and this is something that is highly reflective on Tsukuda’s ability to draw in his audience in general. As is custom, Alice’s background is explored in more detail in order to give the readers insight into the history that led to her dish’s creation, and Soma gets another moment for similar reasons. While Food Wars!’s food and the metaphors the characters use to describe their taste sensations are, as always, on point, the volume ended on a slightly frustrating note. After Alice and Soma both present their dishes, the judges comment on them, but before a verdict is decided, the volume comes to an abrupt conclusion. It’s basically like a Food Network episode of a cooking competition, except instead of just cutting to commercial the book cuts to a two month break, and it’s something that I think is slightly unfair for the audience. While the previous volume ended before the preliminaries were over, it didn’t end midway through someone’s scoring, at least. On the plus side, the end of the volume has a few extra recipes for readers to try out, but that’s hardly enough to curb my disappointment. Food Wars! continues to be an excellent and unique experience. Although this volume had small parts that were lacking, overall the continued advance of the Fall Classic has been an excellent arc that is definitely worth reading for fans of the series. Additionally, if you are a fan of the recent anime adaptation, this volume contains both the conclusion of the anime as well as what happens beyond, so if you want to learn what happens next then this is a must buy. Food Wars! : Shokugeki No Soma Volume 8 will be published by Viz Media on October 6th, 2015. Authored by Yuto Tsukudo and drawn by Shun Saeki, the series adaption began in 2012 and is still ongoing in Shueisha’s ’sWeekly Shonen Jump magazine. 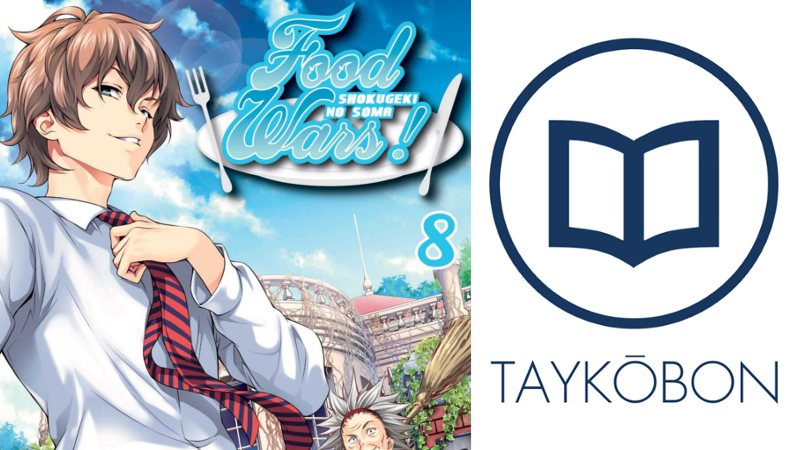 Volume 9 was published in English on December 1st, 2015, and an anime adaption produced by J.C. Staff aired from the Spring 2015 to Summer 2015 season. Picking up this volume or other manga via this link helps support us, we couldn’t do it without you!